JOIN THE SCRIPT ARCHEOLOGIST in "THE QUEST FOR THE GOLDEN SCRIPT™"
Our product line Premiere's with our Introductory Offer. Create your own statement of success with your own version of The Script Archeologist™ World Tour merchandise. You can proudly display your writing successes on your personally detailed swag apparel. The design will include your personal information including Your Name, Project Title/Name, Carbon Date (written, completed, optioned or other important date relating to your project), and Your Location. We combine these details to bring you a unique product that will be your own personal success billboard. on any of The Script Archeologist Consulting Services! What kinds of items can I purchase? We will be offering many items that you can buy. They will include exclusive and unique graphics made by our Associate Progeny Designs. Swag of The Script Archeologist™. Create your own tailored design. Get a unique swag item, THE SCRIPT ARCHEOLOGIST™ WORLD TOUR shirt today! What other kinds of items can I purchase? We offer many e-books from various other authors that you can buy. They include topics that can assist writers from film to poetry to novel manuscripts. CHECK THEM OUT BELOW! 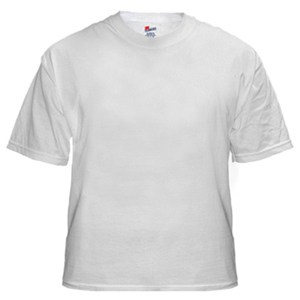 Our durable, high-quality, pre-shrunk 100% cotton t-shirt is guaranteed. 5" x 4" or 4" x 5 "
Made of 100% ringspun cotton for maximum comfort, put on your new favorite T-Shirt from a favorite, trusted name in t-shirts, Hanes. Front (pocket): 6" x 6"
For interest in other styles of men's and women's apparel, contact us for details. All apparel is durable, high-quality, pre-shrunk 100% cotton and guaranteed. 100% cotton, preshrunk, durable and guaranteed. Constructed of mid-weight jersey. Side seamed construction provides a perfect shape, for a contoured but loose fit. 2X-Large (+$3.00) Front: 8" x 10"
Find the item(s) you would like to purchase by using our Purchase Section on this page. Be sure to complete the section on your contact information. Without this we will not be able to contact you once the design mock up has been completed. Once you've designed your item and you would like to order, email us. This will send your design information to our design team. You will receive a confirmation email and be forwarded to our Product Down Payment page. There you will need to complete the payment process through PayPal for your product. You can use your PayPal account or Visa or MasterCard. This non-refundable down payment is $5.00, which will be taken off the full price of your order at final purchase time. Once you've completed your payment through PayPal you will be returned to The Script Archeologist™ Product page. Your information received and your down payment confirmed, our designers they will create a mock up of the item as it will appear once printed to your apparel. Within 2-3 days you will receive an email with a link to view the mock up of the designs you have chosen. In the body of the email will be a link to your Payment Page. If you are satisfied with your design click on the link and proceed with your full payment. You will be taken to PayPal where you will complete your order online using their secure process. Once your payment has been received and confirmed we will have your product created and sent to you. The Script Archeologist.com respects your privacy. We do not sell, publish, exchange, or otherwise provide ANY of the information that you submit to us to any third parties. Having trouble ordering products online? No problem! The Script Archeologist.com accepts orders over the phone. To order by email, please email us at sales@thescriptarcheologist.com anytime. We will return your email within 24 hours by phone (holidays excluded). Before emailing, please choose the details of the item or items you wish to order. Be sure to provide your contact information and a time in which to call. We will instruct you of payment methods and delivery options. The Script Archeologist.com stands behind the authenticity of all of our items and back it up with our 10-day satisfaction guarantee. If any item is not as described you can return (or exchange) an item. See our return policy* for more info. Currently we only accept payments via PayPal using your credit card or PAYPAL account. We accept only credit cards that are accepted by PayPal. You can safely pay for your purchase via PayPal and their secure server, which encrypts all submitted information. All of our products include a 5% sales tax on purchases. Occasionally we will offer coupon or discount codes for use on purchases. Follow these steps to redeem your coupon. If you have a valid coupon or discount code, include that number in the appropriate area of the order section above. The Script Archeologist.com shipping options are for delivery within the U.S. & Canada plus international shipping across the globe. They are based on the total order price. In stock items will ship within the guidelines as stated below. Items ordered on Friday will be shipped on Monday. Remember, business days exclude weekends and holidays. Delivery times based on location. *Oversized and items over 1 lb will be attached a surcharge on shipping. 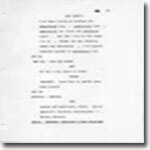 The Script Archeologist.com offers a 10-day money back guarantee on all products if not as described. If you would like to return or exchange an item, please click here to request a form, and we will send you instructions on how to send the item(s) back. 15% restocking fee may apply. Shipping charges are not refundable. Despite our taking every precaution to insure that your item is packaged safely there are times when a carrier may damage an item. If your item is damaged due to shipping, please save all packaging materials that came with your order and Contact Us within the 10 day period. If you are an international customer you may be subject to import duties and taxes, which are levied once the package reaches your country. Additional charges for customs clearance must be paid by you; we have no control over these charges and cannot predict what they may be. Customs policies vary widely from country to country; you should contact your local customs office for further information. Additionally, when ordering from The Script Archeologist.com, you are considered the importer of record and must comply with all laws and regulations of the country in which you are receiving the goods. We will be offering many items that you can buy. They will include exclusive and unique graphics made by our Associate Progeny Designs. They created all of our cool graphics. You will be able to have them displayed on items including apparel, hats & bags, prints & stationary, as well as home and office items (mugs, decorative accessories etc). We will also be creating a unique line of screenwriting tools for assisting you in your script writing. CHECK THEM OUT AS THEY BECOME AVAILABLE! I like the graphics seen on The Script Archeologist site. Do you sell products with them on it? Yes we do have various products available that display artwork from our site as well as other cool graphics. You can buy mugs, apparel along with other items. Show off your personalized The Script Archeologist items. CONTACT US to find more information on how you can purchase them. 600+ grants aimed at writers. Attend conferences, gain project funds, or just earn money to write. All 50 states arts councils represented plus many more opportunities for grant seekers. Our most popular ebook in its 6th Edition. A must primer for writers who dabble in the grant world. This is not a nonprofit grant book. This book's message is directed at the individual writer seeking funds to meet a writing goal. This book caters to you. You love to write with a passion! You write poetry that no one reads. You design stories that no one sees. You are a young writer, still in school, with no place to send your work other than English class or the school newspaper. Hope Clark raised teen writers. Hope mentors teen writers. Hope believes in teen writers, so she wrote this book. 232 markets and 118 pages of opportunity for you to get started with that writing hobby - maybe even a writing career! Markets for the Young Writer gives you guidance on what to expect when making submissions in the real world. Here you'll find more than enough help in getting started. Sick of editors thinking a free book is ample paying for your book review? Here Hope Clark offers the serious book reviewer 80+ publications that pay for book reviews. Never look at book reviews the same again after you read this guide on submitting quality book reviews and book review pitches to editors. You have written poems as long as you can remember. You wish you could display these visions to others, but where do you begin? You begin right here! Hope brings you 467 poetry markets for your verse, and all pay in cold hard cash or publisher's contract. 145 pages of opportunity for you. Available in ebook format - PDF Adobe. Publishers for Poets gives you "hope." And hope is something we spread around pretty thick here at FundsforWriters. You are a struggling writer trying to call the little money you make from your passion an "income." You'd give up your best pen to win a $1,000 writing competition, but the fee is $25. All of them charge fees, so you quit considering writing contests. Well - don't. C. Hope Clark comes to you with an alternative - The No Fee Contest Book. In her research through FundsforWriters, she's identified over 310 writing competitions that don't charge even a single dollar - your hard-earned dollar - for your contest submission. The contests, including available online links, comprise an ebook that not only includes these golden opportunities, but also contains Hope's usual opinion and advice on writing competitions. You live to tell stories. From flash fiction to 50,000 words, you spin tales. Now you want to hold them in your hand with a byline screaming your name. Where do you start? And better, yet, how do you get paid doing it? Funds for the Fiction Writer comes to the rescue with 130 pages of 400+ listings from contests to literary journals; from publishers to magazines. Receive compensation for your words from $10 to thousands. There are enough places in this world paying for words so don't give your work away for free. Hope Clark offers opportunity here. You will be amazed. Hi Hope, I felt compelled to inform you that your wonderful e-book Funds for the Fiction Writer is perfect to compliment my online workshops! When writers complete my workshop and are searching for a market to submit their masterpiece...your e-book is the perfect place to find those markets! I recommend it to all writers trying to get their own bylines. The e-book is overflowing with paying and hungry publishers waiting for fresh voices to put in print! As a previous Editor-in-Chief of a college literary journal, I appreciate your inclusion of those overlooked markets. My illustrator husband, of Pigmi Art, found publishers for his art and fantasy stories! Hope, thank you for the unmatchable service you give your fellow writers! As a shy writer you feel like you have to choose the lesser of two evils – marketing your words to hoards of people ogling at you, or putting your writing on the shelf and seeking other employment. Wrong! The Shy Writer gives you options – lots of options about meshing your personality with your dream of being a writer. You don’t have to sell your soul to sell your words. Forget those people who tell you to change, to put on a dog-and-pony show, or to stand on your head to sell a book. 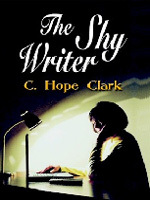 Hope Clark gives you the support you need to be the person you are – The Shy Writer. For more information on all our services, be sure to view our services on the various pages in our site. For consultations contact us. The Script Archeologist team looks forward to hearing from you to answer all your questions and to provide you with the highest quality services. A complete listing of all our Services and their associated Fees. The consulting fees paid by credit card via PAYPAL or MONEY ORDER (pre-received & received bank clearance). UNCOVER MORE!